Buy Bugs from Brad the Bugman – Order Fly Parasites Today! Another reason to go natural and buy beneficial insects instead of chemicals is that more and more insects are showing a resistance to pesticides and insecticides. A recent study with fruit flies showed that when they were exposed to DDT it not only didn’t kill them but they had found a way to metabolize the poison. 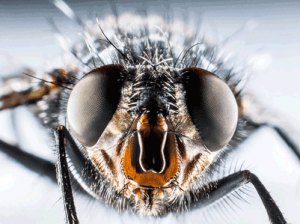 So, now, these fruit flies are using pesticides as food. Did you ever see Willard? Beneficial Insects have been counted on to provide ongoing pest control in gardens, around homes and businesses since the late 1880’s. Right now, cutworms, aphids, spider mites and other “bad bugs” might be destroying your flower beds and vegetable gardens. What is an organic grower to do? You certainly don’t want to resort to harsh, toxic and expensive chemicals that can take hours to spray and reapply. Many growers are turning to biological control to help them eliminate or reduce the bad bugs. These good bugs are the natural enemies of most garden pests. This is an effective was to solve your garden problems that doesn’t entail chemicals. Plus, there are so many other benefits. Aside from chemicals being toxic to the environment and our bodies, they also kill the good bugs in their quest to wipe out the bad bugs. A yard without natural predators means a world of bugs gone wild. There’s nothing to keep the bad bugs from running amok. And though you might have stopped your original bug problem, a new wave of bad bugs are moving in to cause more trouble. When you introduce beneficial insects into your garden you won’t have to worry about causing a major imbalance in the world’s bug population. The good bugs provide ongoing pest control and can tip the scales in your favor when the bad bugs come to call. Step 3. Click to submit your order. Subscribe to News and Special Offers!